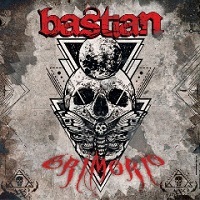 This review is for “Grimorio” which is an album from BASTIAN a Metal/Hard Rock band from Italy. Not to be confused with BASTIAN the Metal band from Canada. “Grimorio” is the Italian band’s fourth album, and comes courtesy of Underground Symphony Records. BASTIAN is the project of guitarist and composer Sebastiano Conti. Over their four albums, the band has been held a revolving door of musicians, with only Conti staying the constant. For me, that never bodes well, but with that said, the musicians assembled for “Grimorio” are all top notch talents at their instruments. The album opens with “Pale Figure”, with the sounds of howling wind and a slamming door. The music immediately following certainly has elements of grim doom, harkening the band’s listed influence of BLACK SABBATH. New vocalist Nicklas Sonne, throws down his best attempt at a menacing vocal. At least early in the song, he seems to be trying to channel OZZY. Towards the end of the track, we get a bit more range, and the inspiration seems more DIO. Next up is “Sly Ghosts”, and it’s a pretty solid track overall. We get a good idea of Sonne’s full vocal range, and the entire song has the band firing on all cylinders. Conti’s guitar is surprisingly subdued, which is usually far from the case when a guitarist is leader of a project like this. More often than not, the music in these circumstances usually end up being overwhelmed by “show off” style leads and runs. That’s not the case here, and it’s refreshing. My compliments to Conti. “The Trip” follows, and the album takes a bit of a surprising turn towards a classic “southern rock” style sound. Overall it works, good riffs and hooks, but there are a few questionable time changes that just don’t work for me. “Infinite Love” qualifies as the album’s power ballad, opening with some nice acoustic guitar from Conti. The song really suits Sonne’s vocals, perhaps better than any other track. “It’s a Lie” “Southern Tradition” “The Time Has Come” all feature a very similar main riff, and the three songs seem far to similar to have been placed back to back to back . They’re all enjoyable in their own way, but the similarities are just too uncanny. “Epiphany’s Voodoo” Finally showcases some of Conti’s fretboard work in a more “show off” manner. The guy has some skills, so it was nice to finally see them laid out. The song is instrumental, features some uncredited keyboards and features a cool LED ZEPPELIN feel to it. The album’s final cuts are “Black Wood” and “Fallen Gods”. “Black Wood” is a fairly straight out rocker, while “Fallen Gods” returns back to the menacing SABBATH style sound. Overall, “Grimorio” is good. At times, it seems the band is still searching for their identity and a constant sound. They also suffer from the usual Italian to English translation issues in their lyrical content. It would be nice to see them maintain this lineup for another album, and allow some chemistry to develop. There’s a good foundation here, and with more narrowed influences, and better lyrical content, BASTIAN could be a band to watch.